TRIVIA of Noh : Q108 :What role did koutai play in terakoya in the Edo period? | Home | Trivia | Q108 : What role did koutai play in terakoya in the Edo period? What role did koutai play in terakoya in the Edo period? Koutai is a style of short Noh chants that was popular among common people in the Edo period. The children of commoners, mainly boys, were taught them at terakoya, a form of private educational institution. One of the reasons for the popularity of the short Noh chants was that people were familiar with them from childhood. 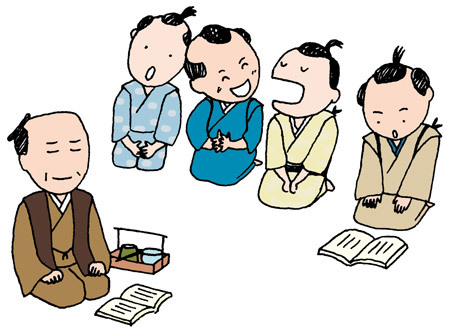 Terakoya mainly taught practical knowledge, such as writing, reading and abacus, but the children were also asked to read sample materials to give them knowledge in various fields. Noh chants may have been considered ideal for this as the stories include plenty of historical events, famous poetry and morality tales. The woodblock print Terakoya Koutai Zu-hanga (School Boys Learning a Noh Chant) by Utamaro shows a smile-provoking scene of children practicing a Noh chant with their mouths wide open.